Prepared by Ian Smith, 30th May 2011. 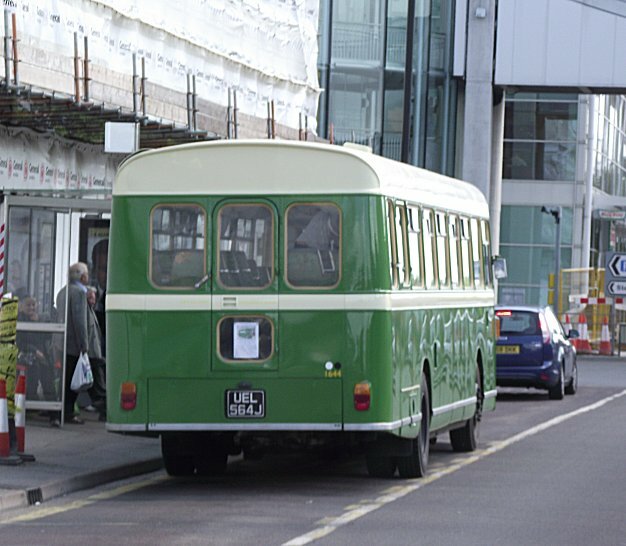 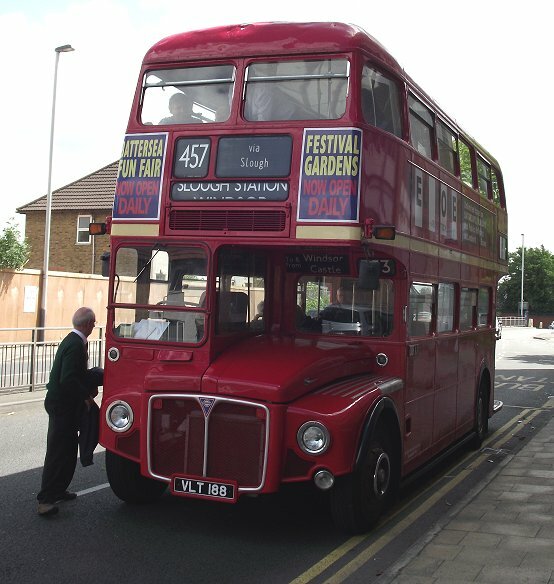 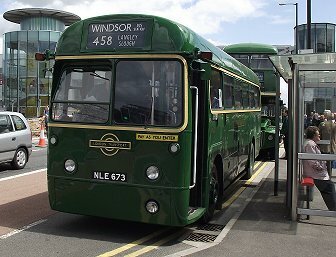 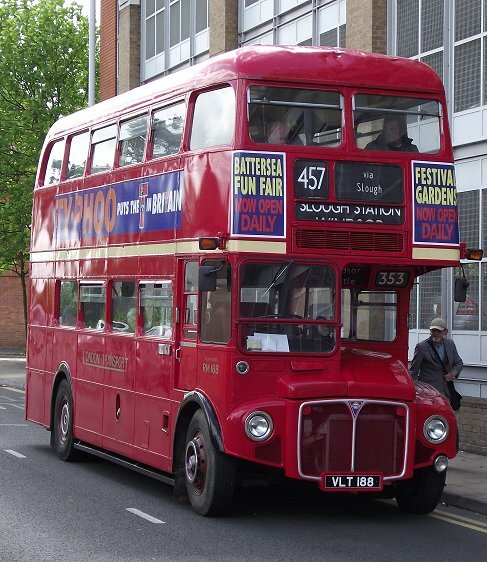 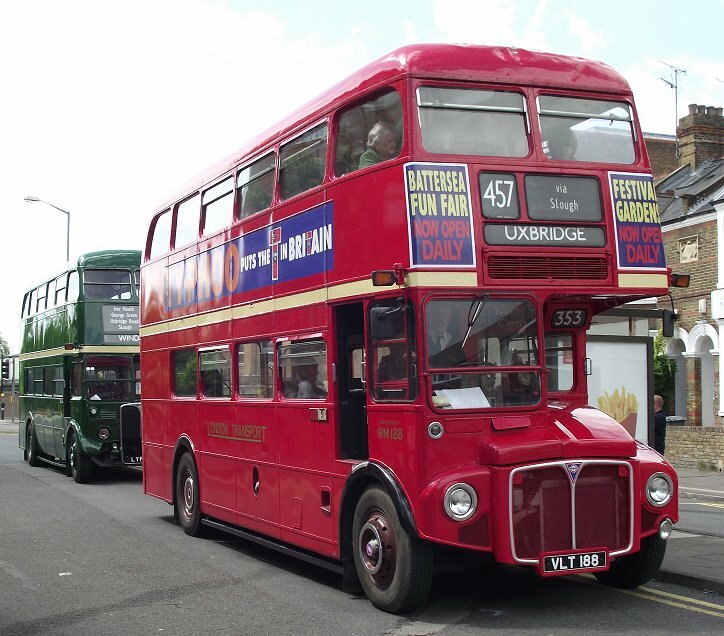 Red RM188 was on the stand at Windsor Bus Garage (as was) when RT2083 arrived. 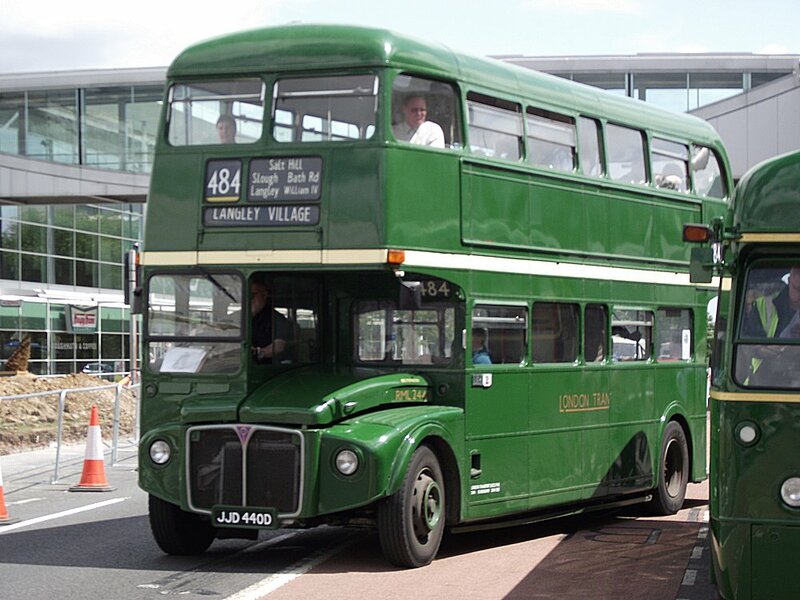 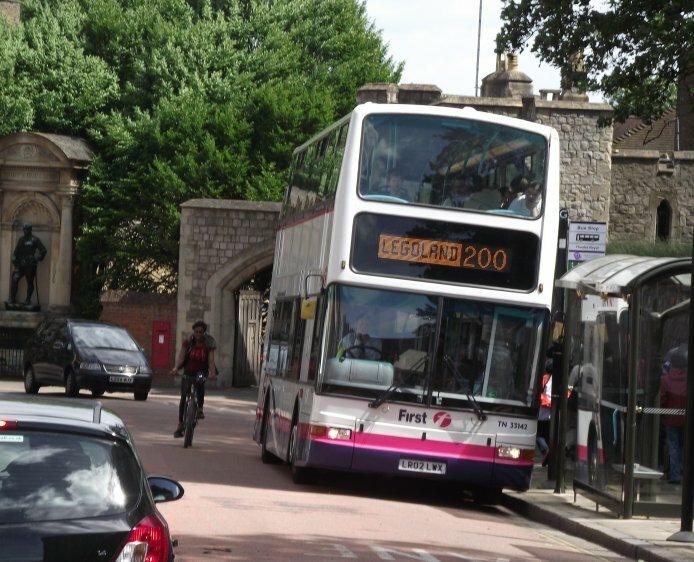 The RM had worked through from St.Albans, first as a 330 to Hemel Hempstead, then as 301 to Berkhamstead, followed by a 353 run through Amersham, the Chalfonts, Gerrards Cross and Slough to reach here. The crew was busy changing the blinds for the 457 duties during the day. 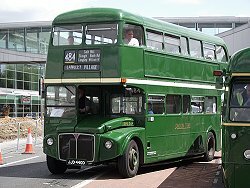 It didn't seem right to hog one of the few seats on RT2083, so I swapped onto the RM for the return to Slough - and indeed on to Uxbridge. 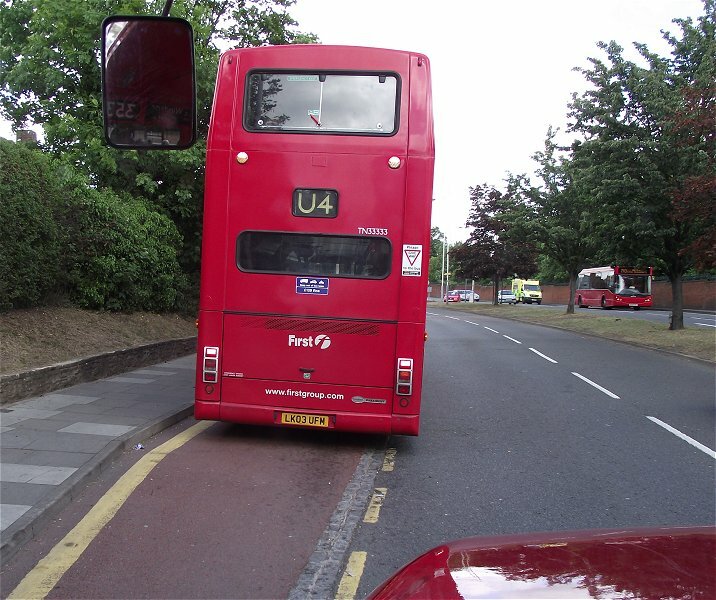 I even got my favourite seat behind the bonnet. We were soon away, and quickly back under the walls of Windsor Castle. 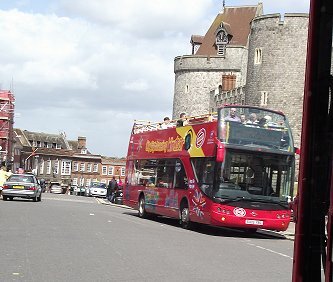 There were not many ordinary service buses about, despite the crowds of people, but there was one of Ensignbus' City Sightseeing Ayats-bodied Volvos, No 376, gliding past Windsor Castle with a good load, and at the stop further down was First Berkshire's ex-London Trident TN33142 on the Legoland service. 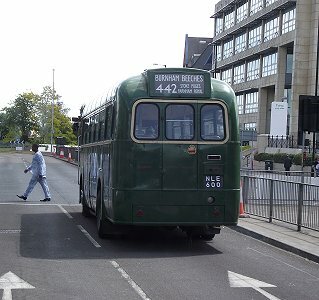 RML2676 came round the corner, just where I couldn't get a decent shot. 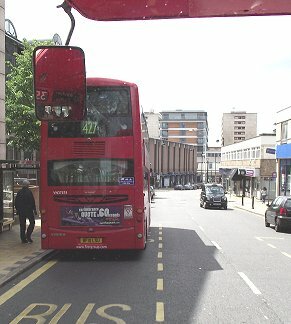 Then something long, new, sleek and very blue came round the corner, too quickly for a good photo. ES64047 is a 2007 Mercedes-Benz Citaro, branded for the Slough Heathrow 7 Series. We wound our way back out of Windsor, back to the banks of the Thames, then under the tight bridge under the Western branch railway, then out to the by-pass and back to Slough. We made a triple passage of Wellington Street between the roundabouts, in order to serve west-bound stop G. In the process we passed behind RM1859 as we first entered the western roundabout. 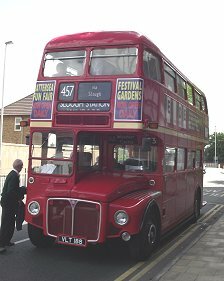 It was west-bound to Cippenham on the 407. 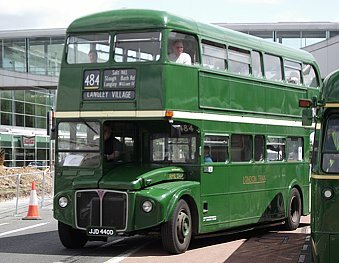 We then passed incoming Hants&Dorset Bristol RE 1644, which had worked a Thames Valley route 63 from Maidenhead via Cliveden. As we came back to the stop other buses passed on the eastbound carriageway: First's current offering on the Heathrow service 75 - an Alexander bodied Dart SLF, DMA42346, followed by MB90 on a 441 to Hedgerley Corner. 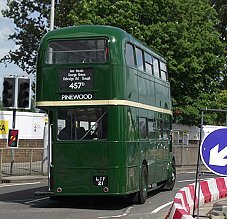 After our bus-stop call we rounded the roundabout again, following RT2083 which was inbound from Windsor on a 457D to Pinewood. We came up behind RF600, waiting at the lights while preparing to go out on the 442, and then we were finally away, free to leave Slough behind. We turned north-east onto the Uxbridge Road, and choggled through suburbia and countryside. 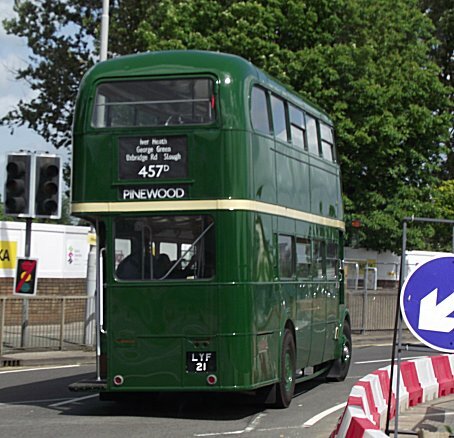 At the roundabout where the 457Ds turn hard left to Pinewood we continued up Church Road, then had to turn right down Bangors Road North to regain the road into Uxbridge - now, inevitably, Slough Road. 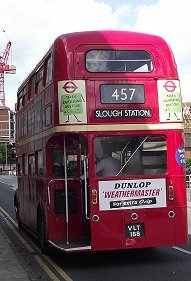 We crossed the rivers Colne and the Grand Union Canal, and climbed up towards the crux of Uxbridge. 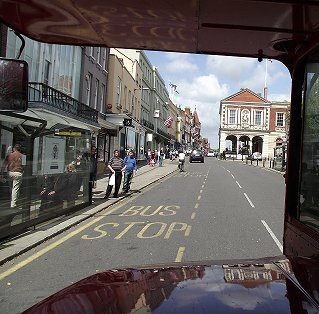 But we were not heading for the bus station, so headed round the town. We came up behind a local Trident with a significant number: TN33333 on the U4. We went past, and turned into Chippendale Waye to find our terminal stop, on the east side of the shopping massif. 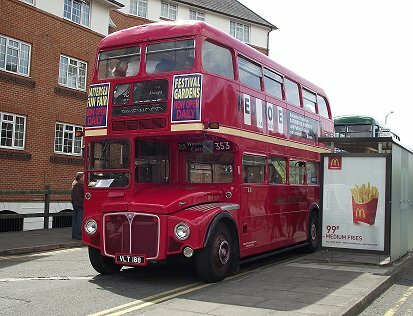 We were soon away again, rounding the shopping block, and passing VN37878 preparing for a return trip to Acton. We rounded the big roundabout, and took the Slough Road. 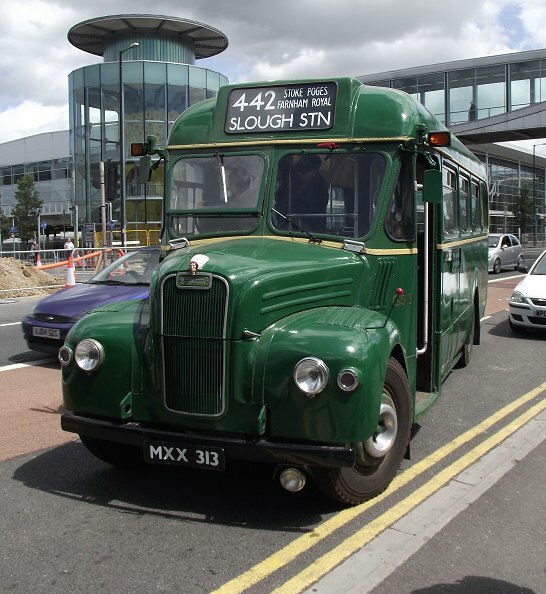 Soon we were back in Slough. 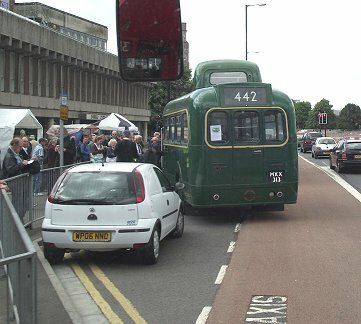 The scene was improved by GS13, which rounded the eastern roundabout ahead of us, terminating on the 442. The stop was well-occupied. 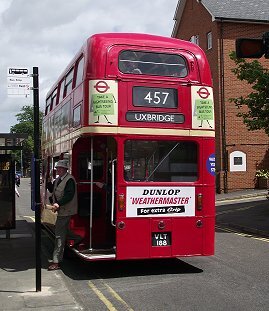 RF673 was on a 458 from Uxbridge to Windsor, having come via Iver. 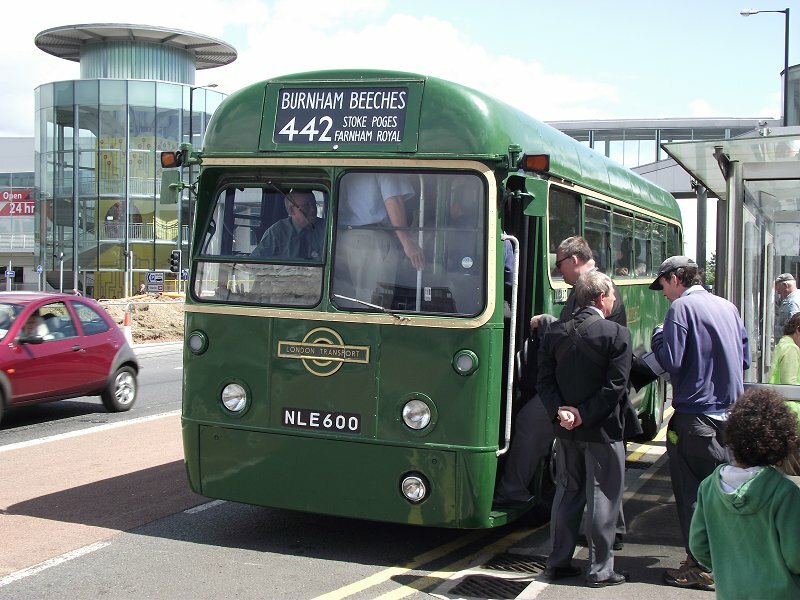 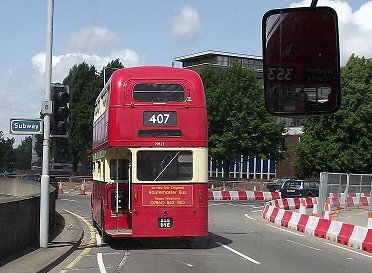 RML2440 was on a 484 eastbound to Langley Village. 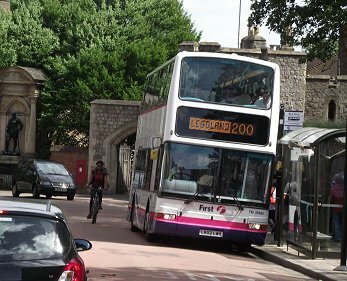 While I debated whether to catch the RF, whilst taking pictures, the decision was made for me, when the three buses, RF, RML and GS, all took off. RF673 arrived, with another 442 to Burnham Beeches, but that wasn't what I wanted just now, either.